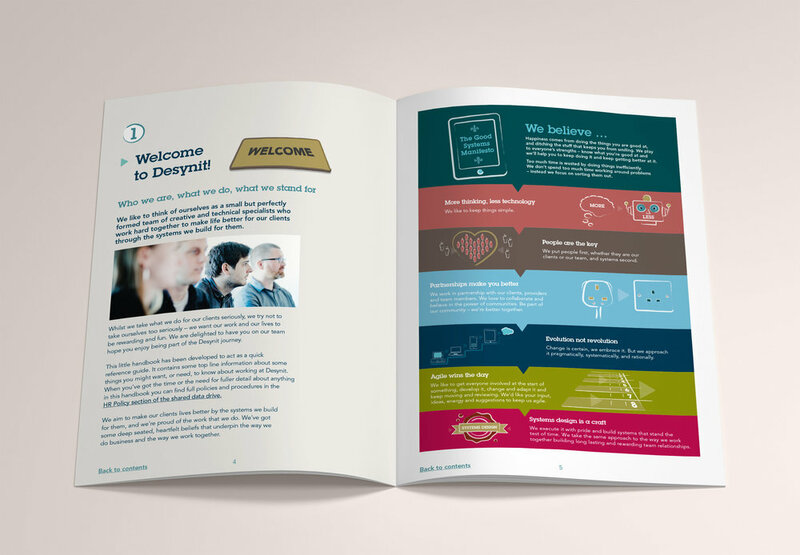 I was contacted by existing client, Desynit, to create an internal employee handbook. Desynit had written the content and the piece already existed as a shared Google document. However, it was currently quite a dry, text-only document. It needed to be brought to life – in line with the rest of the Desynit brand style and be something that new employees would warm to. The piece was designed as an A4 booklet, but supplied as a single-page pdf, purely for viewing on screen. Having pre-thought to design it as a booklet, meant that it could be printed as a hard copy easily in the future if required. The final pdf was supplied to the client including clickable links which helped take employees directly to relevant documents stored on their internal server. A short run of digitally printed copies were also produced.